Welcome to the Town of Sullivans Island website for the 2018 Comprehensive Plan Update/Re-write. We hope you will find this website an informative tool as the Town moves through its 10-year update/re-write of its Comprehensive Plan. 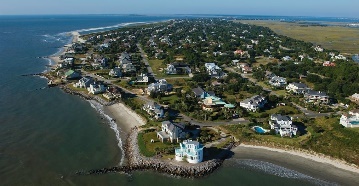 Sullivans Island is a small barrier island community bounded by the Atlantic Ocean and Intracoastal Waterway, within 10 minutes driving distance from downtown Charleston and immediately adjacent to the Town of Mount Pleasant and City of Isle of Palms. The Towns Comprehensive Plan provides for an opportunity to capture the history of Sullivans Island and express the shared community vision of what the Town of Sullivans Island means now and what it should be in the future. This long-range strategic planning document provides a framework for Town elected and appointed officials, and Staff, to develop policies that would realize the community’s vision. It is the Towns goal for this new version of the Comprehensive Plan to be a living document that will be easy-to-read, interactive and a valuable reference tool for residents and officials alike. We hope you will find offer your voice and opinions as the Town engages in this community conversation about the future of Sullivans Island. Why Have a Comp Plan?